From £1,599 per person for 14 nights (£2,299). exploring the canals and old town of Strasbourg. Embark your ship in Arnhem and cruise overnight towards Bonn where you can discover the highlights of the city, make sure you visit the museum that is dedicated to the life and work of Ludwig van Beethoven. Next, explore romantic Cochem on the Moselle before enjoying views of the old walls of Zell and spending a magical afternoon in Germany’s oldest city, Trier. A key highlight is the twin villages of Traben-Trarbach which straddle the Moselle and then discover Koblenz's rich history which is reflected in a wealth of monuments and historic buildings. 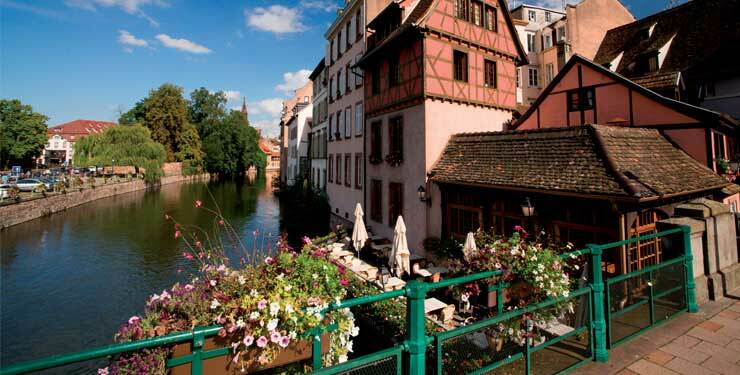 After Frankfurt with it's dramatic skyline and the medieval Bavarian town of Miltenberg and Aschaffenburg, you can look forward to exploring the capital of Alsace, Strasbourg, whose cobbled streets, half-timbered houses and Gothic cathedral can be seen on an included tour and canal cruise. Finally, explore Rüdesheim and Andernach before an overnight mooring in Amsterdam before heading home. entertainment and activities on the ship. 1) Price based on 2 sharing a Haydn Deck (aft) cabin with return coach travel from Folkestone via Eurotunnel or ferry. 6) VIP door to door travel service included.